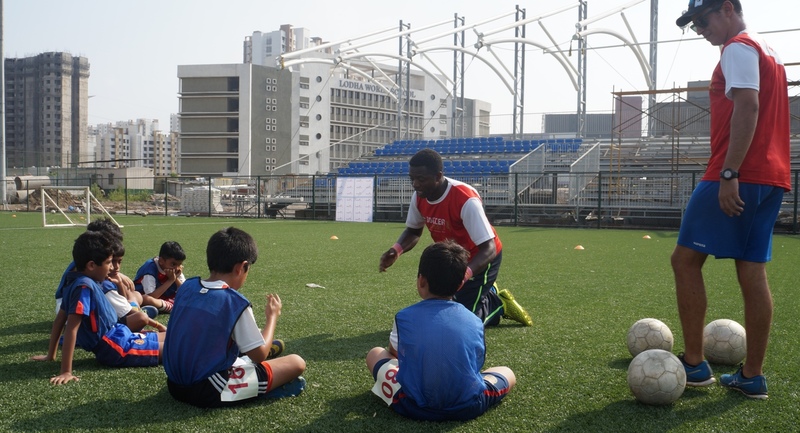 The first trials for the IOT - Arsenal Soccer Schools’ Development Program in Maharashtra, held on May 16th and 17th saw a phenomenal response with over 200 young footballers making their way to Palava City. Apart from Palava, participants travelled from Thane, Navi Mumbai, Kalyan and as far as the western suburbs of Mumbai. The trials were conducted on the Palava Titans FIFA certified turf under three age categories - Under 9, Under 12 and Under 16, and were overseen by UEFA licensed Spanish coach, Ibon Labaien Soto from the IOT - Arsenal Soccer Schools. The 100 top performing players from the first round will now be invited for the final round of trials on 30th May, based on which 25-30 players will be given an opportunity to be part of the IOT -Arsenal Soccer Schools Development Centre at Palava City and potentially avail various talent-based scholarships. The program will run for a period of one year, with further trials being held every three months. India On Track (IOT), a football development organization has partnered with Arsenal FC, one of the leading football clubs in the world and together with the Club, run IOT - Arsenal Soccer Schools in India, providing full-time training and conditioning to students and teaching them to ‘Play The Arsenal Way’. The program is already operational in 9 cities across India and brings top-level technical expertise to the fore through a team of highly qualified international and Indian coaches, spearheaded by IOT’s Technical Director, David Moliner Monedero, a UEFA Pro licensed coach. The training programs are conceptualized, designed and developed by the Technical Director in accordance with Arsenal’s globally renowned soccer schools programme. India On Track (IOT) has been set up to inculcate a culture of sport among the youth and create a platform to learn and participate in various disciplines. Most importantly, to do so by creating grassroots and development initiatives executed in a secure environment through world-class training and conditioning techniques.